Amazon Price: $19.99 $14.70 You save: $5.29 (26%). (as of February 9, 2019 11:53 pm - Details). Product prices and availability are accurate as of the date/time indicated and are subject to change. Any price and availability information displayed on the Amazon site at the time of purchase will apply to the purchase of this product. Use Hydrofarm's 7-day Digital Program Timer to water your system every day, every several days, or several times per day! 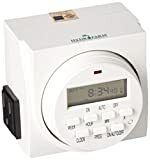 The timer allows up to 8 on/off times per day, a one (1) minute minimum "on" time, and different settings for different days. The timer is a great way to keep everything on track and promote the healthy growth of your plants and flowers. It's three prong grounded, has an LCD digital display for easy operation, includes a battery backup, and has a dual outlet feature so you don't lose a plug. These timers are great for lights or hydroponic systems. Using timers to automate your hydroponic garden adds convenience and encourages productive growth of your plant. Timers allow you to provide a consistent light, nutrient, and airflow program for your garden. The battery backup assures you stay on schedule even after a power outage. Especially useful for orchid and African violet growers.